Spotlight: Minnesota Resources: Cemetery and Newspaper. The Great Migration Newsletter (GMN) offers feature articles on a variety of topics, including the settlement of early New England towns, migration patterns, seventeenth-century passenger lists, church and land records, and much more. The eight-page GMN complements the individual sketches in the Great Migration books, and addresses broad issues key to understanding the lives and times of New England's first immigrants, 1620-1640. The first issue of 2015 will be mailed in the first quarter of this year. Print subscribers to volume 24 (2015) receive a new issue of the GMN through the mail each quarter ($20 for a one-year subscription or $36 for a two-year subscription). Online subscribers access issues through GreatMigration.org, where the GMN is posted each quarter and past issues from volumes 11 through 23 are available for viewing ($10 for a one-year subscription). To subscribe, please visit GreatMigration.org or call NEHGS Member Services at 1-888-296-3447. This database contains genealogical sketches of families enumerated in the 1790 census for Berkshire and Hampshire Counties (which now also includes Franklin and Hampden Counties). Each sketch begins with the head of household and includes genealogical and biographical details as well as information about children and children's spouses. Many families migrated into western Massachusetts only to migrate further west, often through New York. These sketches were submitted by NEHGS members and staff and edited by Helen Schatvet Ullmann, CG, FASG. The Irish Genealogy Study Group will meet on Saturday, January 24, 2015, between 9:30 a.m. and noon in the second floor Education Center at NEHGS. The study group gathers to talk about research problems and share solutions. Everyone is welcome to come and join in, and people can attend part or all of the session. (The NEHGS Library is open for research from 9 a.m. to 5 p.m.) Contact Mary Ellen Grogan at megrogan@ix.netcom.com for more information. Presented by Judi Garner, Director and Managing Archivist at AJHS-NEA, and Stephanie Call, Archivist and Manager of Digital Collections at AJHS-NEA. The American Jewish Historical Society--New England Archives collects, preserves, and makes available for research the documented history of the Greater Boston and New England Jewish communities. Accessible to NEHGS members, these collections include some important genealogical resources. Learn more about AJHS--NEA and its partnership with NEHGS, its collections, and what available resources are important to the family historian. Register today! Can't attend the live broadcast? A recording will be posted to our website the following day. Learn more about the American Jewish Historical Society including what types of resources are available to NEHGS members and information on locating and using these records. Visit the Online Learning Center for subject guides on a variety of genealogical topics, informative videos, webinars, online courses, and more. If you have questions or feedback, contact Ginevra Morse, Director of Education and Online Programs, at gmorse@nehgs.org. The American Jewish Historical Society (AJHS) is the oldest ethnic historical society in the country. 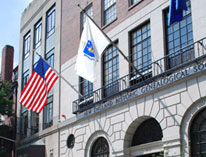 NEHGS is the permanent home of the New England Archive of AJHS, that portion of the AJHS collection relating to Jewish genealogy and Jewish cultural and institutional history in Greater Boston and New England. Each month we feature selections from Chapters in American Jewish History, a series of essays edited by Michael Feldberg, PhD, Executive Director of AJHS from 1991 to 2004 and current Executive Director of the George Washington Institute for Religious Freedom. This month, we feature an essay on the Hendricks family, who transformed American industry through their pioneering production of copper. By supporting the New England Historic Genealogical Society's Annual Fund, you make an investment in your own family history research and its preservation. Annual Fund donations help to keep NEHGS membership fees down, enhance our website capabilities, make our educational programs possible, and provide our members with access to expert genealogists and researchers. Please consider a tax deductible gift. Give now! The city of Brainerd is located in central Minnesota. It is the seat of Crow Wing County. The Evergreen Cemetery Association currently owns and manages Evergreen Cemetery, which is in Brainerd, and the Memorial Gardens Cemetery, which is located just north of the city. The association was established in 1879 to sell lots, record burials, and maintain the cemetery grounds. It has made a burial index available on its website. Click the Directory of the Dead link to access the index of nearly 20,000 records. One database is organized alphabetically by surname; the other is organized by cemetery block. The data fields are name, death date, age, block, lot, and plot. If you use the Grouped by Surname index, you will find a link to the lot number in the record so that you can view it on the Grouped by Block pages, and vice versa. Additional links in the search results will take you to the deceased's memorial at Find A Grave and, if the deceased was a veteran, to the association's U.S. military service page. There are also several cemetery block layout maps from the years 1879, 1948, 1953, 1954, 1963, and 1996, and a table showing the burial patterns over the years on the website. Copies of records may be ordered from the cemetery office for a fee. The Great River Regional Library serves a number of communities in central Minnesota. Among them is the city of St. Cloud, which is the county seat of Stearns County. The library has provided two indexes to the St. Cloud Times covering January 1, 1928, through December 31, 2013. The obituary database can be searched by name. The data fields are name, publication date/page, spouse's name, and alternate name. The news article index can be searched by keyword. The data fields in the search results are article title and publication date/page. Copies of article can be requested from the library. Mary Ferm of Bainbridge Island, Washington: My mother has an old clock that contains a letter with the clock's history. The letter, dated August 29, 1940, was written by my grandfather's aunt, Ruth Squires, when she passed the clock down to my grandfather, William Squires Kilpatrick. She wrote, "The old clock was purchased from a wedding gift of money by my grandfather and grandmother Nichols Sherman. They had their wedding journey in the early days of the Erie Canal (Sept. 25, 1833). That was quite a trip in those days. There is a description of such a wedding journey running through some numbers of last year's Atlantic . . . Our grandmother's name was Ruth Amelia Belding. She was born in Ashfield, Massachusetts." The Nichols Sherman family lived in Wyoming, Wyoming County, New York. Ruth Amelia Belding Sherman (1812−1895) moved west to Tacoma, Washington, with two of her children and their families in 1889 after Nichols Sherman died. The clock has always been with a member of the family. Inside the cabinet there is a paper sticker that says "Bridson." I suppose that is where they bought the clock, possibly in Rochester or Albany, New York. Correction to David Lamb's clock article of January 14, 2015: In the example provided about "reading" a series of numbers and initials found in a clock, a dating error was made, which is corrected here: "For instance, to the practiced eye, 'tjw, Edb,1.5.74, Rt&s, nmsx2,' can be read as 'Thomas J. Wymss (Edinburgh) 1 May 1874, Repaired time and strike, new mainsprings, both sides.'" Thanks to reader Carolyn Thomas of Santa Barbara, California, for pointing out the inconsistency. Carol Austin of Garden Grove, California: The survey on multiple descents really struck home. I'm not actually sure how many sets of common ancestors I have, but it's at least two to five. However, what I have kept track of is how many common ancestors my husband and I share. We descend from at least 24 sets of common New England ancestors to date. Hence our children have many fewer ancestors than most people. About the closest my husband and I are related is 7th cousins once removed, but many are at least 9th or 10th cousins. When we married, 60 years ago now, we had no idea we were related at all. Wendy Carroll of Coeur D'Alene, Idaho: My Burnham ancestors of Ipswich, Massachusetts, married cousins over many generations. The three original Burnham brothers (Thomas, John, and Robert) immigrated in 1635. Two remained in Salem, and I descend from both of them on my Dad's side. I just found out recently that I descend from the third brother on my mom's side. My parents are 8th cousins and my grandparents were 5th cousins but none of them knew it. We're scared to tell Mom because she'll have a heart attack! Jennifer Thurber Willis of Cincinnati, Ohio: I think the most times I am descended from any one couple is nine times from Albrecht Zabriskie and his wife Machtelt Vanderlinden, who were early settlers of New Jersey. I descend from three of their five sons. 47%, Yes, I descend from a common set of ancestors through two to five lines. 8%, Yes, I descend from a common set of ancestors through six to ten lines. 2%, Yes, I descend from a common set of ancestors through eleven or more lines. 12%, Yes, I descend from two to five common sets of ancestors through multiple lines. 4%, Yes, I descend from six to ten common sets of ancestors through multiple lines. 3%, Yes, I descend from eleven or more common sets of ancestors through multiple lines. 34%, No, I am not aware of having any multiple descents from a single ancestral couple. This week's survey asks what significant genealogical research you have done free of charge for other people. Take the survey now! Slow progress is being made in the search to discover the origins of Paul Fronczak, a Nevada man who was abandoned as a baby and then adopted by a family whose own son had been kidnapped. The Sons of the American Revolution is offering a program, "Operation Ancestor Search," at Fort Hood in Killeen, Texas, that teaches wounded, ill, and injured service members in the Warrior Transition Unit how to locate information about their family history. "Inside county jails across Utah, Arizona, and Idaho, nearly 2,300 inmates voluntarily meet as family history indexing teams to help organize genealogical records around the world." The Indiana Gazette, of Indiana, Pennsylvania, reports on new information about a local man who died during World War II. The Bookstore at NEHGS has a new look, additional features, and easy-to-use navigation. To celebrate this new, streamlined shopping experience, we are offering 10% off all in-stock Mayflower titles, including the Mayflower Families Through Five Generations titles (known as the "silver books"); John Howland of the Mayflower by Elizabeth Pearson White; Strangers and Pilgrims, Travellers and Sojourners by Jeremy Dupertuis Bangs; and four titles by Susan E. Roser (Mayflower Births and Deaths, Mayflower Deeds and Probates, Mayflower Increasings, and Mayflower Marriages). To receive your 10% discount on Mayflower titles, enter the code MAYFLOWER15 in the discount field of the checkout (this field will appear after you enter your shipping address). Or mention this code when calling toll free, 1-888-296-3447. Discount is good through January 28, 2015, while supplies last. Prices do not include shipping. Massachusetts and Texas residents will be charged local sales tax. Our research tours are filling up--register today! Members, if you register online for tours, be sure to first login to receive a special member discount. Where: 99-101 Newbury St, Boston, Mass. When: Saturday, January 24, 2015, 10-11 a.m. When: Saturday, January 24, 2015, 2-3 p.m.
NEHGS has been collecting unique items of Americana and fine art since its founding in 1845. Among its collections you will find early American portraits of some of New England's known and lesser-known heroes and heroines, including John Adams, Captain John Bonner, and two rare seventeenth-century portraits of Edward Rawson, Secretary of the Massachusetts Bay Colony, and his daughter, Rebecca. Other highlights include a mid-eighteenth-century easy chair belonging to John Hancock, coats of arms, and early family registers. These unique objects paint a picture of daily life in America. Learn the stories behind our treasures! Tour attendees are welcome to use our resources following the tour. Register today! When: Friday, February 6, 2015, noon-1 p.m.
More than just "a file of the dead," Mount Auburn Cemetery's historical collections are an incredible resource for families, researchers, and genealogists. Aware that they were creating a new American landscape, the founders of Mount Auburn took care to preserve the Cemetery's records, and recent efforts have now brought these extraordinary collections to light. Join Mount Auburn's Curator of Historical Collections, Meg L. Winslow, to learn about the Cemetery's collections, the stories they hold, and how to access them. Register today! Questions? Call us at 617-226-1226 or email education@nehgs.org. To advance the study of family history in America and beyond, NEHGS educates, inspires, and connects people through our scholarship, collections, and expertise.